Binungey or binongey is a rice cake delicacy in Pangasinan which is malagkit (sticky rice) soaked in coconut extract and steamed in bamboo over fire. It comes from the Pangalatok word nungey, meaning, cooked in bamboo. A unique take that got my interest. Last January 2010, I was invited by the North Philippines Visitors Bureau to join a media tour of travel writers and bloggers to experience North Luzon for seven days starting in Cagayan province all the way to Pampanga to sample the various local cuisines and experience the attractions offered by the various provinces along the route. Binungey was served for lunch during our Hundred Islands trip and I got curious with it. At first glance, it’s quite unusual that several nodes of bamboo were lined on the table and peering inside, grated coconut was on top of something. When it was cut in half, there was cooked glutinous rice, lightly salted and smelled with the hint of gata (coconut milk). This rice delicacy is found in Alaminos, especially in Barangay San Jose, where the best ones are said to be made. It is also sold as a snack in Bolinao and Anda even has its Binongey Festival. Traditionally, it was served only on special occasions, especially during Christmas, due to the long hours of preparing and cooking this rice cake. Malagkit is washed and soaked either in water for two hours. 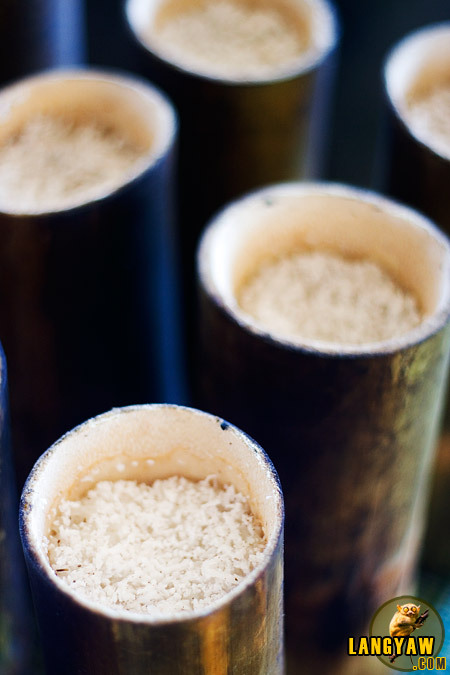 Once ready, bamboo tubes, preferrably, a year old, is filled 3/4. Coconut extract is then poured and covers over half an inch of the malagkit. Grated/desiccated coconut from the extraction is then topped to prevent ash and dirt from reaching the rice mixture. Cooking is a bit tedious and critical. If the fire is too strong, it will burn the bamboo. If it’s too low, the rice mixture might be uncooked. To the binungey cook, experienced has already taught him how strong the fire is. Steaming it usually takes 2-3 hours. Locals usually pair the bland binungey with sweet mango or soak it in local hot chocolate. Still, others dip it in sugar. 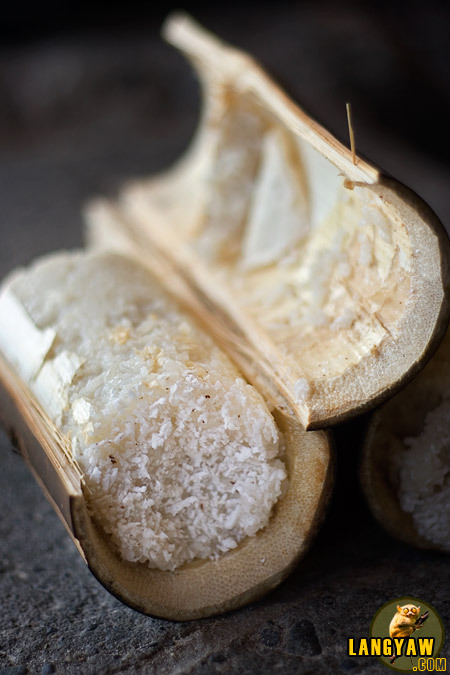 Being a Cebuano, I can’t help but compare it with our own version of what we call the puto: unground glutinous rice slightly sweetened and prepared almost the same way except that it is not placed in bamboo, without the grated coconut and with the addition of ginger. Once cooked, it is then wrapped in strips of banana leaves. It is best eaten in the morning and eaten exactly with the same pairings. This is a good post! I like this delicacy and tasted it 10 years ago when a friend brought me one. I have forgotten its name and now I am reading it, it makes me crave for it! Kudos! ahh, ito pala ung Binungey or binongey..
something the same sila kuya, kaso di siya niluluto sa bamboo kuya. @shervin, di ba dami yan sa anda and bolinao? thanks for this article. we really miss this one delicacy from home. sherry is wanting to go hoem to cebu next year. i might have the time to go to and we want to meet you personally to thank you.